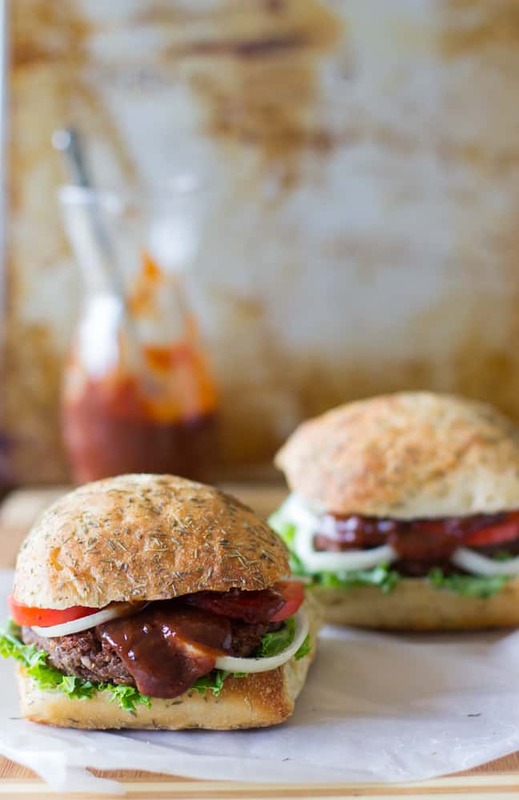 These Vegan and Gluten Free Black Bean and Quinoa Burgers with Strawberry BBQ Sauce will transform the way you see veggie burgers…they are loaded with flavour, texture and are so filling! If you’re someone who doesn’t love veggie burgers, I’m about to change that for good. We are talking I-would-rather-eat-this-at-any-barbecue veggie burgers. Let’s go. Last year on one of our excursions in Portland, Jamaica, the Mr. and I went to a burger joint . Not just any burger joint but one that was supposed to have THE best burgers in the entire Caribbean. Huh? We’ve got to check this out clearly. I’m not sure who was paid to write these claims but I was most disappointed. My sad, soft and soggy version of a veggie burger made of soggy spinach and melted cheese on top was disastrous. His previously-frozen beef burger and our out of the bag fries didn’t help much either.These were NOT the best burgers of ANYWHERE in the world. Then I started to think, is this what people think of veggie burgers? This is BAD! Since then, I’ve kind of been on a mission. I have had some amazing vegetarian food in this country but not burgers. I find that’s kind of sad since items like sweet potatoes and black beans are popular staples in Jamaica. I’m sure they are out there, somewhere, waiting for me to discover them. Until then, it was time for us to make some of our own at home. Then black bean and quinoa burgers came along, WHY did I have a fear of black beans? Why didn’t I know they were so delicious? So glad that view is gone, because these babies were SO DELICIOUS. They are also completely vegan and honestly didn’t need any cheese because flavour of the burger plus the Roasted Strawberry BBQ Sauce, was amazing. Avid meat lover Mr. Jessiker Bakes chowed these down alongside me ½ second after I turned my camera to OFF, and we kind of just sat in silence. I couldn’t speak while eating a piece of heaven! Finally we both came up for air and did a fist bump of “great job” to each other although, I have to credit him 100% for making these. Wednesday tip? Get on to making these! I’m not here to make you feel like this will replace your meat burgers, because these aren’t imitation burgers, they have their own beauty. Here’s to seeing myself at endless barbecues chowing down on these! If you try these Black Bean and Quinoa Burgers with Strawberry BBQ Sauce please let me know in the comment section below, or tag me on instagram with the hashtag #jessicainthekitchen! For more exclusive recipes follow me on Instagram AND on Snapchat: jessinkitchen. 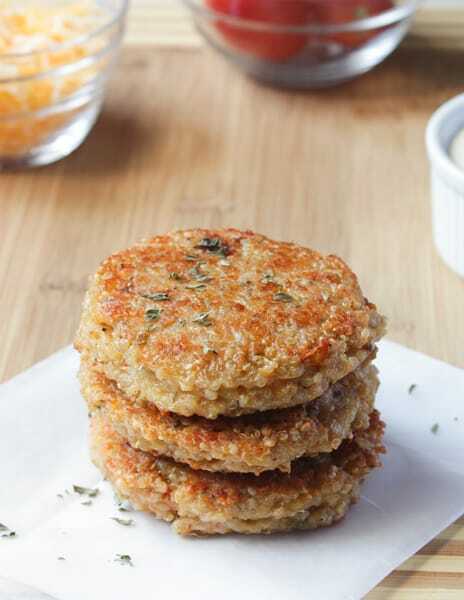 If you loved these burgers, you’ll always love these Sun-dried Tomato and Mozzarella Quinoa Burgers! Heat the first tablespoon of olive oil in a pan over medium high heat until hot, and sauté the onions, red bell peppers, garlic until cooked down, about 3 minutes. Season with salt and pepper slightly to taste. Allow the vegetables to cool a bit. In a food processor, add the black beans, cooked quinoa, sautéed vegetables, red pepper flakes, gluten free flour, ground black pepper and sea salt. Pulse until combined - you want it all completely incorporated, until it's one cohesive mixture and the black beans are nice and mashed in. On a cookie sheet lined with parchment paper, form the mixture into burgers (ensure to spray your hands with oil first - they are sticky!). I like to use my ½ cup measurement to pack them in, then form them in my hands into shape. They can make 4 large burgers this way. Optional: refrigerate for about 10 minutes before cooking. In a pan over medium high heat, heat about 2 tablespoons olive oil. Add the burgers to it, being careful not to overcrowd the pan. Once the burgers sizzle, lower to a medium heat and cook about 6 minutes on each side, until crispy and cooked through. Serve as you desire, in a burger form or in a lettuce wrap. We added burger buns, onions, tomato and lettuce and barbecue sauce. Enjoy! 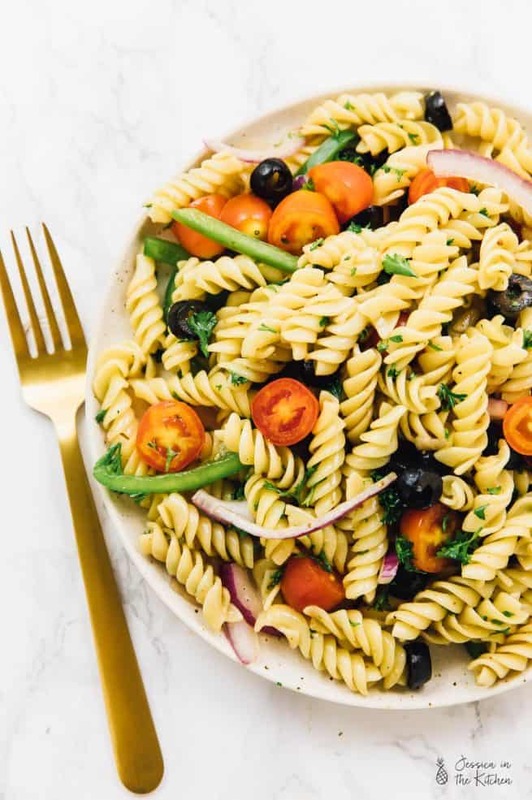 This recipe is vegan and vegetarian. The burgers can be made for a meal prep. They can be stored in single layer freezer bags in a freezer-safe container lined parchment paper. They can be frozen up to a month. I’m the kind of person who’d choose veggie burgers over meat anytime. Although I can honestly say that most restaurant versions make me cringe uuuhhh do they even know what the words “veggie burger” stand for? (hint: not mush or sand). But your version looks like something I’d really enjoy, my friend! That strawberry bbq sauce is calling my name! Thanks Consuelo! Haha yes some of these versions are bad, homemade is always better! Oh my, look at that strawberry sauce! I probably would just take a spoon and dig right into that. The whole thing looks pretty incredible. Love the seasoning on those rolls! I will admit that I’ve never tried a veggie burger, but now I’m intrigued! Love this recipe, especially with that strawberry sauce. Pinned! Thanks Gayle, you really should try! Holy moly that looks stunning!! Oh my goodness, these burgers look amazing, Jessica! I have never had a veggie burger in my life, but I’m thinking that that must change and soon! I can’t stand how amazing these look. I love how you topped them with your strawberry BBQ sauce. Omg the flavors must have been mind-blowing! Gorgeous photos. I love love the lighting! Pinned. Thanks so much Sarah! 🙂 And thanks for pinning! They’re so pretty Jessica! Love those rosemary buns too. These amazing sounding burgers just made me stop and stare and say yes please. Oh Jessica! You are killing me! That strawberry BBQ sauce! I’m so in love with it and what a clever, clever idea. 🙂 Thanks for sharing such a fab recipe! Pinned! Thanks Justine! And thanks for pinning! Strawberry BBQ Sauce?? Yum!! What a fun combo! Your so creative! This is perfect for summer! Jessica this is one beautifully mouth watering vegetarian meal! LOVE it!! Pinning! That is such a good idea for vegan and vegetarians. I like this. Thanks so much Kelly! Yes, I think it would, Mr. Jessiker Bakes loved it and he’s a meat man! This sounds delicious. Strawberry bbq sauce?? Yummm!! I want that!!!! That BBQ sauce – whoa! The strawberry combo is amazing! I’m all over these burgers, Jessica! Very creative and delicious. I love that you are on a mission to elevate the veggie burger to new levels of this deliciousness. Solidarity, sister! 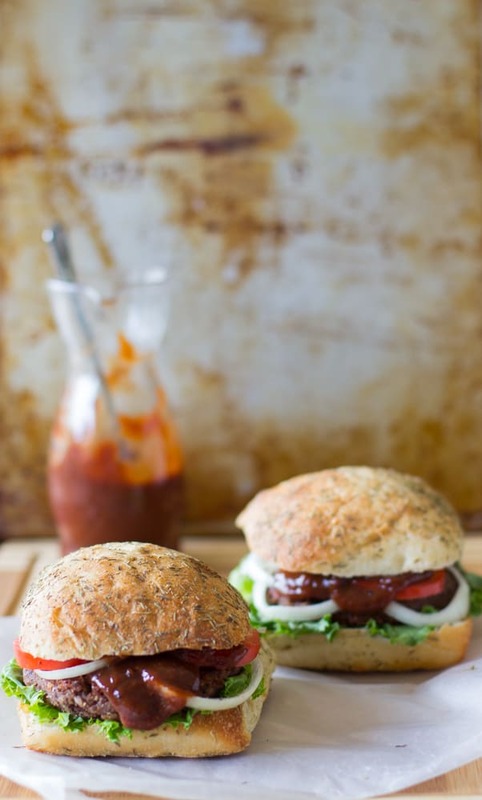 Your roasted strawberry bbq sauce sounds perfect for these! Pinned and want! They look delicious! I have never had a veggie burger. How crazy is that? I almost bought some pre-made patties at the store the other day, but I’m thinking your homemade version looks and (I am sure) tastes much better :). Beautiful pictures too, Jessica. Pinned and definitely making these soon! Thanks Kati and thanks for pinning! You’ve got to try a good veggie burger! Good veggie burgers can be hard to find sometimes! 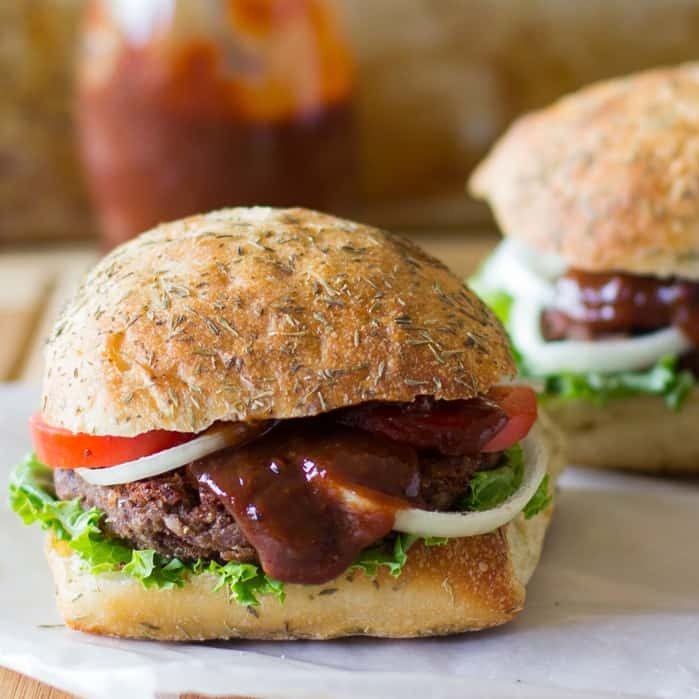 These sound so so good – especially with that strawberry bbq sauce. I usually pick vegetarian meals over meat so these are absolutely my style! Thanks Ashley! I love me a good veggie burger. Girl strawberry barbecue sauce??!!! That sounds so tempting! Oh wow I love this idea and to top it off you added the strawberry bbq sauce!! Yum!! 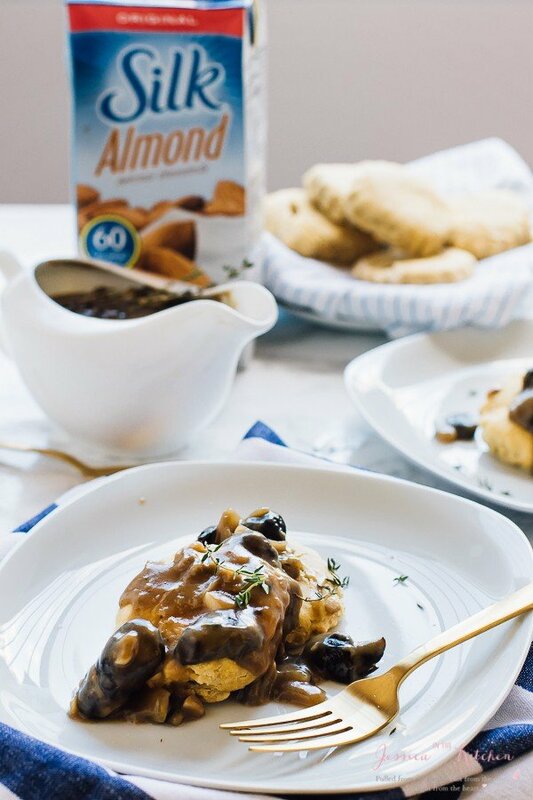 This is a perfect Meatless Monday meal. I’ve been on the hunt for a new recipe and this is it exactly. What am I to do with the magic dust? Recipe describes how to make it but not what to do with it. You’re to use a tablespoon of the magic dust in the barbecue sauce. Thanks so much and please forgive the oversight. Two of us missed this; I think we were too excited to get on with what is a most intriguing recipe! Thanks again. Oh that’s fine Stan! No problem. 🙂 I hope you enjoy it! Sounds delicious! Do the onions get sautéed with the red pepper? Hi Mary, yes you do. Thank you for asking, I’ve fixed that in the instructions! These burgers sounded amazing! We just tried to make them tonight but as we were cooking them they started falling apart! 🙁 What can we do to prevent this???? Hey Stephany! Sorry to hear that – it’s hard to tell since I wasn’t there with you, but they were pretty sturdy for us. You refrigerated them? And ensured the oil was hot first? Oh Candy I’m so happy to hear!! Even more happy that a meat lover said this haha! Thanks so much for letting you know! these look so delicious. I was just wondering if you think putting the veggies in the food processor is necessary? I do not have one at home, but I’ve been thinking of purchasing one because they’re used in many vegetarian recipes. You don’t have to use a food processor, I suppose you could just crush them together with a potato masher. It would be a little harder but would get the job done. Be careful not to overdo it! Also, I recommend a multi purpose food processor/chopper such as the Ninja or Nutribullet so you could also make smoothies or juices or anything else in there too! My burgers are in the fridge cooling and then i am going to fry them. Question is- as i don’t want to eat all of them in one sitting- should i cook all of them now then freeze the unused ones, or freeze them as they are now and cook when ready. looking forward to eating it ! You should freeze them uncooked. Good luck and let me know how it goes! I’ve made a few of your recipes and I have loved them all! I tried these last night and completely bombed. I couldn’t get the burgers firm enough when I fried them. I had to improvise with the mixing and I used my blender. Do you think they wer mixed too much?? Trying to get guidance so I can try again! BIG caution on this: if you are NOT using unsalted beans the recipe needs no salt at all. I made it, without thinking about the salt in the can, adding the salt called for in the recipe, and the batch was inedible. Canned beans are usually heavily salted; if you look you may find some that are not. In any event, this is a great recipe. Just be sure to check the salt. Hi rsp thanks for this comment there was a typo in the ingredients section. We’ve updated it to reflect this! It should be 1/2 teaspoon of sea salt! I hope this helps! I can’t eat the flour. Can I substitute with anything else? Hi Cindy! We haven’t tested it yet, but you should be able to use chickpea flour as a substitute.